by Todd Walker Part of our Self-Reliant Summer series I first heard the song Ticks by Bard Paisley at a bank drive-thru window. Clever lyrics. Why share such a trivial event? 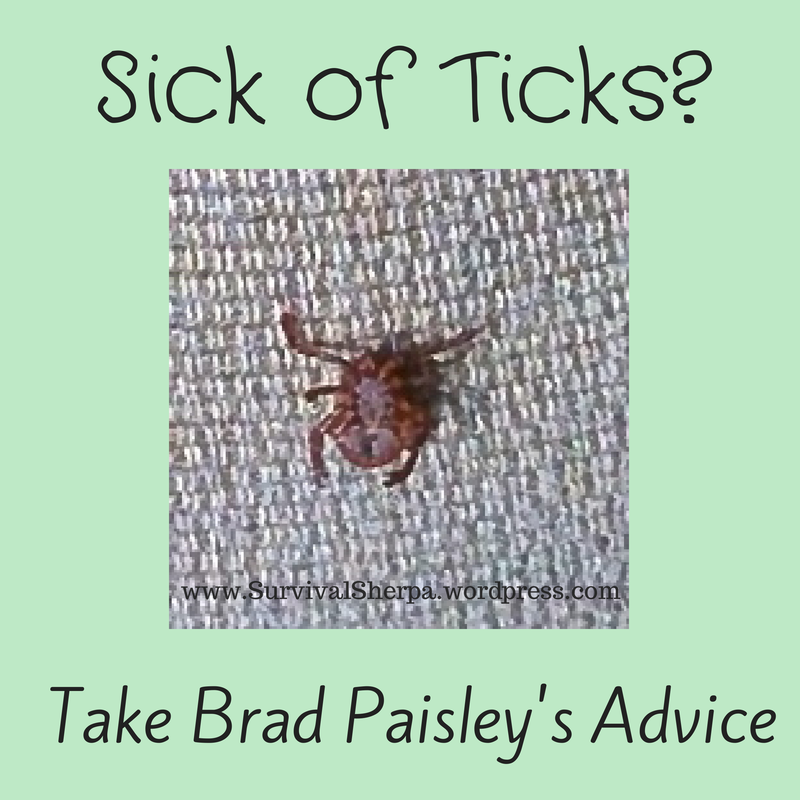 Because I like Brad Paisley’s music and hate ticks… passionately!! These blood suckers are anything but petty parasites for anyone venturing outdoors. Their genetics seem to steer them to the most delicate and hardest-to-get-at places on the human body. Like zombies looking for a blood meal, they sink their barbed jaws in your skin and gorge. For me, I’d rather roll naked in poison ivy than have a tick bite. Once removed, they leave itchy, nagging bite marks for months. However, applying my plantain spit poultice immediately and repeatedly for a few days causes the bite symptoms disappear. We’re in the middle of peak tick season (May – June – July). That’s why I love dirt time in the winter – little to no ticks! My personal war on ticks involves prevention and early treatment. Is your skin crawling yet? No need to panic over these blood-bloated pests. Just don’t exhale. Breathing sets off the tick honing device. You see, ticks are attracted to you and me, all mammals in fact, because we spew carbon dioxide with each breath. Check out this creepy field experiment at North American Hunter. Calvin and Grant placed a one pound container of dry ice in a deer bedding area. In less than 8 hours, they harvested over 600 of these blood suckers! One more than the mark of the beast. There’s a the correlation here I think!! If only there were a way to experience bug-free dirt time. There isn’t. Biting insects are part of the outdoor experience. But you can decrease their damage by following these tips. As Ben Franklin once said, “An ounce of prevention is worth a pound of cure.” Proactive parasite prevention will help you get out there without constantly worrying about tick-borne illnesses like Lyme disease or Rocky Mountain spotted fever. There are hundreds of species of ticks in the world but only a few are of concern to you. 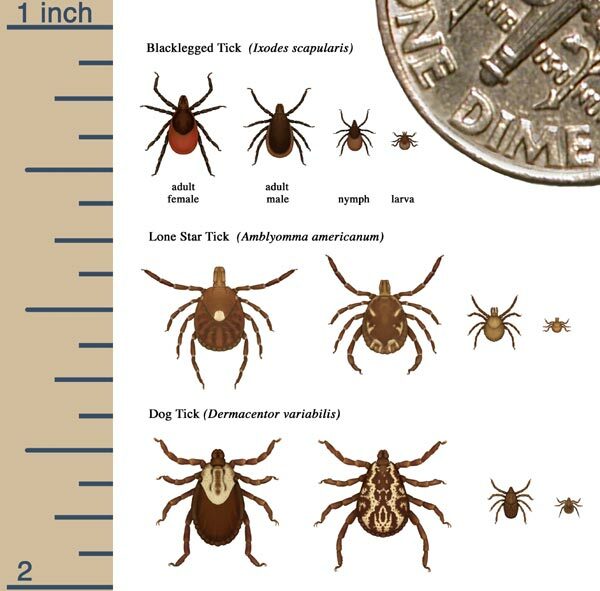 Blacklegged tick, Wood (Dog) tick, and Lone Star tick are the 3 arachnids on top of the tick-born disease list. It is recommended by the CDC and other government health organizations to apply repellent containing 10-30% DEET. That alone is the reason I do NOT apply DEET to my skin. Call me skeptical or even a tin foil hatter but I’ve seen the damage done in the name of public health in more areas than pest control. One of the tenants of our Doing the Stuff Network is to trade theory for action. Will natural (non-DEET) insect repellents really prevent you from becoming a tick’s next blood meal? I haven’t tried all these recipes. If you’ve found/created an effective natural concoction, please share in the comments. The war on ticks needs you! Here are a few DiY recipes to consider. Within 3 to 30 days after being bitten, the first sign of Lyme disease is a reddish bull’s-eye about 2 inches in diameter at the bite location. If detected in the early stage, Lyme disease can be treated with antibiotics for a quick recovery. Later stages respond to antibiotics but may take months or years to cure. Any itchy rashes or reactions after being bitten is a sign to seek medical attention. An extra precaution would be to preserve the tick in a small vial of alcohol or taped to a white piece of paper for identification purposes if complications arise. I’ve never been a tick saver. I burn ’em! My hatred for ticks can not be overstated! At the same time, I love being outdoors. So my war on these blood suckers continues with the lyrics of Ticks swirling in my head. What’s your best tick tips on prevention and treatment? Every year, for the last 22 years, I go to Boy Scout Summer camp. Every year we tell the boys, “stay off the trails, walk in the middle of the road”. Every year some dumb kid doesn’t listen. Every year we pick ticks. Last year after ONE romp through the trail, we picked over 44 ticks off ONE KID, and that is only in the places we can legally look (grin). We told him to get his friends to look elsewhere. Your picture above does not show them actual size, reduce them by half. Most were the size of this period”.”, they just crawled, that’s the only way we could spot them. The only thing that has come close to working is “Deepwoods Off”. That’s a job I don’t envy, lol! You’re right about the scale on the pic. I was covered in the little ones after a hunt years ago. Not fun! Thanks so much for this article… I haven’t had a tick on me since I was 9 years old, but I think it scarred me for life… I’m constantly vigilant! I have been having good success with gel ionic silver under a band-aid for wounds. Considering the powers of ionic silver it would be my first choice for a home treatment for a tick bite. Also, chickens do tick patrol and will keep the homestead free of ticks. Another good reason to have chickens. I’ve yet to try ionic silver you keep mentioning, Caroline. I’ll have to check it out. Thanks! I have found that the best way to prevent is off on your boots. Spraying the stuff on your skin is not the healthiest thing I’m sure, but spraying ing it on you boots works well. I have also found that when grubbing (clearing brush), ticks are really bad, so sometime you just have to use the commercial bug spray. There just isn’t much of a choice. Even so, I have been looking for bug repellent plants to use instead. I think hickory, wax myrtle, and beauty berry plants are all supposed to work, but I haven’t had a chance to hit the woods and test them. Also, dawn dish soap kills them. Not sure if works on ticks though. Haven’t seen anyone mention Permethrin yet. This stuff will keep them off your clothes. And an application will generally last a wash or two before losing effectivenes. I’m happy with the `Fite Bite` brand but I see Amazon sells a Sawyer Products permethrin product that has good reviews. And I am a tick magnet, in particular the larva stage of the deer ticks. So I’m all for keeping them at a distance if at all possible. Last year I got ate up with ticks so I looked for a solution. That solution was Permethrin. I used a 36% product which is then mixed 2 oz. to a gallon of water in a pump sprayer. I laid my clothes out on the deck and spayed until damp (both sides). Then put your clothes in a trash bag for an hour or two to let the solution wick into anyplace you may have missed. Then hang out to dry or put in the dryer. Both methods worked for me. I only treated my clothes twice all season. I had zero live ticks on me. I did find a couple dead ones and several bites which I assumed were from ticks, but they did not like the environment (meaning my skin under my permethrin clothes) and they left the building. I also sprayed the diluted solution on my carpets and sofa. This same solution was sprayed in outbuildings (walls and ceiling) to keep the wasps away. This stuff is very effective and it has residual effect. It will not work on your skin because your skin ‘metabolizes’ it somehow and renders it ineffective after about 15 minutes. We have had decent luck so far with the essential oil homemade recipes. Also, for our dog’s kennel, we put cedar mulch in her run area. That combined with her dog collar has made a HUGE difference in the number of ticks we find on her. Guineas and chickens can help reduce the number in your yard. Our yard is fenced and our guinea fowl roam free…soon the chickens will too. When you are inside the fence, ticks picked up are MUCH less than if you roam outside! You will definitely get ticks or seed ticks all over you. Wear some bug spray Always check yourself or a family member! My youngest son got a lone star bite and now has the alpha gal allergy (allergic to mammal meat and carries epi pens now). All he was doing was helping in the yard and garden..one got him in the armpit. That bite doesnt have to be on long to start the process and allergy.